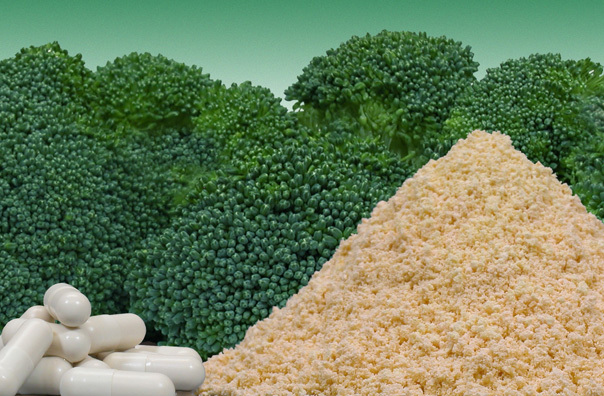 Besides Diindolylmethane (DIM), Indole-3-carbinol (I3C) is also present in cruciferous vegetables. Both DIM and I3C show activity, yet studies have also uncovered sharp contrasts between them in one critical area — consumer safety. Anyone advocating the benefits of I3C over DIM is ignoring the published scientific facts. A careful review of the research reveals serious questions concerning the safety of I3C. The entire motivation for microencapsulated, absorbable DIM was based on testing which supported its stability and efficacious use. Human studies, often at five times the typical supplement dose of DIM, have shown good tolerability. Reports concerning I3C, however, provide a different story. Oral I3C in humans has been shown to have unwanted effects at only 2 times the normal dose with symptoms of dizziness, gastritis, and nervous system toxicity. Unlike DIM, I3C has been shown to be a tumor promoter in chronic use studies which follow thyroid, colon, and liver health in mammals. I3C increases the production of 4-hydroxyestrogen (a “bad” estrogen metabolite, associated with increased cancer risk and other negative health outcomes in humans). DIM leads to reduced activity of the enzyme called CYP1B1, which acts as a catalyst for 4-hydroxyestrogen production. Therefore, unlike I3C, DIM does not promote tumors in mammals, reduces the production of 4-hydroxyestrogen, and promotes safer estrogen metabolism than that seen with I3C. Microencapsulated DIM is very stable during storage and during digestion. It turns out that I3C is not active in your body until it is converted into DIM in our stomachs. I3C is highly unstable and can transform into many other non-DIM substances. As a result, after taking I3C, a mixture of byproducts leaves the stomach, some being absorbed, but most remaining in the intestinal tract. Formaldehyde is released in the stomach with every use of I3C. Also, I3C can react with other substances in your diet, including vitamin C and many foods, making it unpredictable to use as a supplement. Heat and moisture cause I3C to break down in supplement capsules and turn into a host of other substances of which DIM is only a small portion. 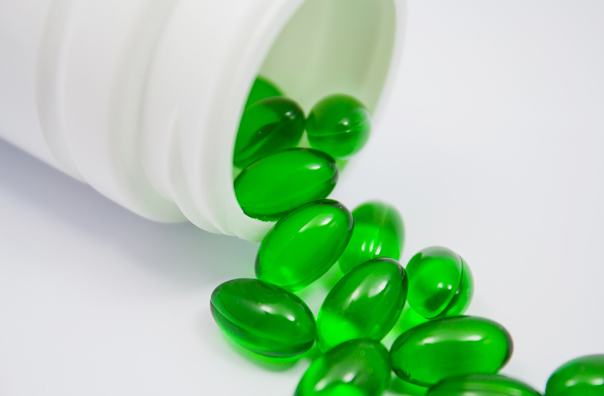 Alternatively, microencapsulated Diindolylmethane (BioResponse DIM) has proven stable during prolonged exposure to high temperatures and humidity. This includes exposure of BioResponse DIM to sustained temperatures of 104º F for a period of 6 months. Throughout this time periodic testing of the DIM content with a qualified testing procedure showed no loss in DIM potency. This testing is part of an ongoing Quality Assurance Program which documents the stability of BR-DIM® in accelerated and real time aging conditions for at least two years. Microencapsulated DIM (BioResponse DIM®) has proven very stable and requires no conversion in the stomach to become active. 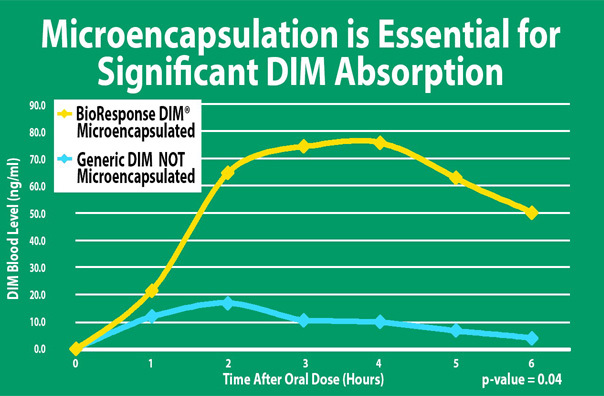 Use of microencapsulated, absorbable BioResponse DIM has been shown effective in amounts close to that obtainable from our diet (0.3 mg/kg/day of DIM). Because of I3C’s instability and reactivity, I3C requires about 10-15 times more than this (4.5 mg/kg/day). Higher doses of DIM are well-tolerated. Dr. H. Leon Bradlow, the original I3C researcher, has stated, “Because I3C gets converted in the stomach to intermediaries that have undesirable side effects, I would not recommend its use.” Dr. Bradlow has since written numerous articles on the benefits of DIM. The demonstrated lack of side effects from high doses of absorbable DIM further underscores its safety when used at lower doses as a dietary supplement. 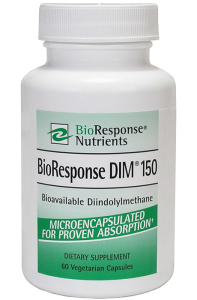 BioResponse DIM provides an efficacious approach to promoting healthy estrogen metabolism.